The bow area features recessed speakers and drink holders, comfortable backrest cushions, a top-mounted wraparound stainless steel rail and adult-sized legroom. 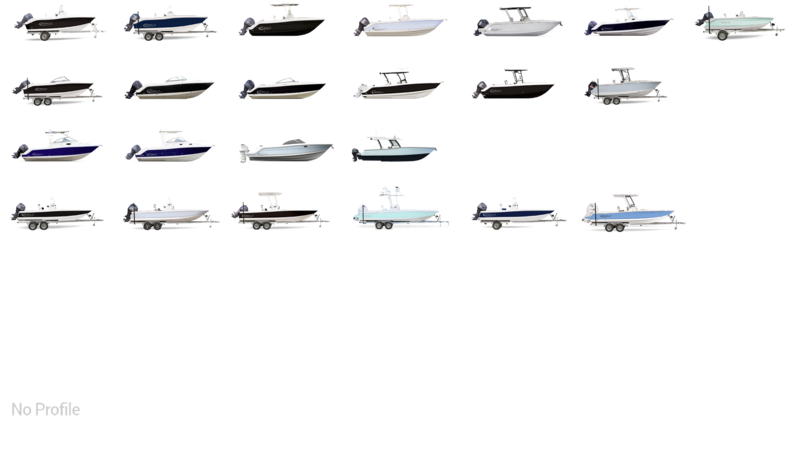 Remove the cushions, add an optional fiberglass insert and the bow transforms into a huge casting deck. Well-placed 19-gallon fish boxes are easy to reach. Insert the optional bow filler cushion and you've got your own personal tanning salon. A secure stainless steel hand rail surrounds the bow area and is accessible both from inside the boat and dockside. The standard insert table can be positioned fore or aft. 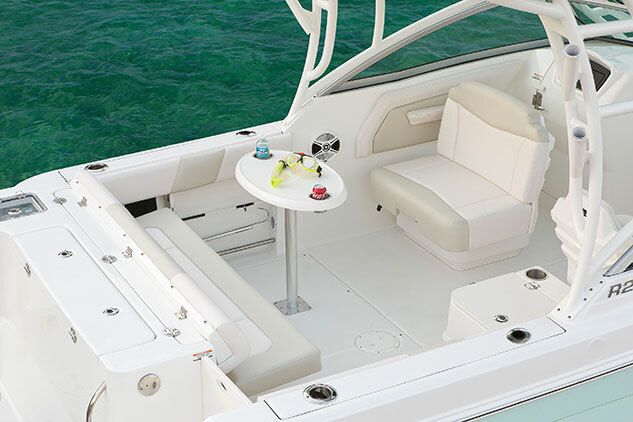 Lift up the cushion on the aft-facing starboard seat and a cold drink is always within reach. 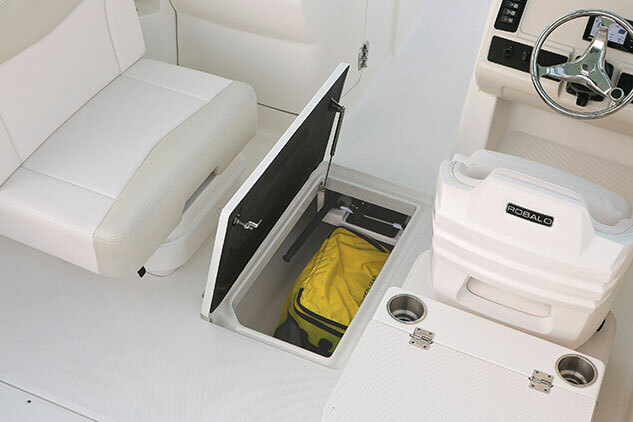 The floor locker is wide enough for wakeboards and also provides secure rod storage. 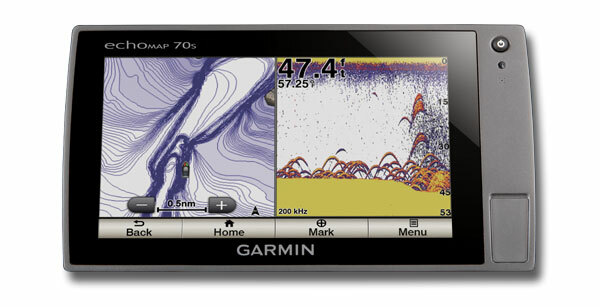 A built-in drain minimizes water build-up and a secure stainless steel shock allows one-handed access. 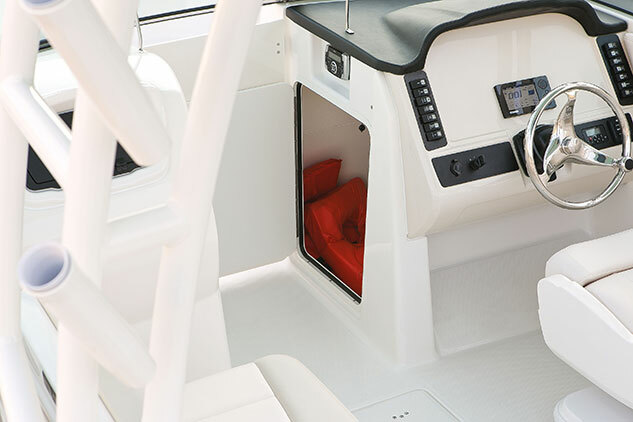 Starboard helm console storage area is perfect for large items including the bow filler cushion. 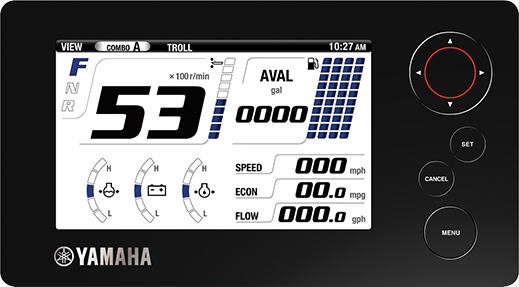 Note the AM/FM, bluetooth capable control unit stows out of the elements and the primary door swings for wind protection. 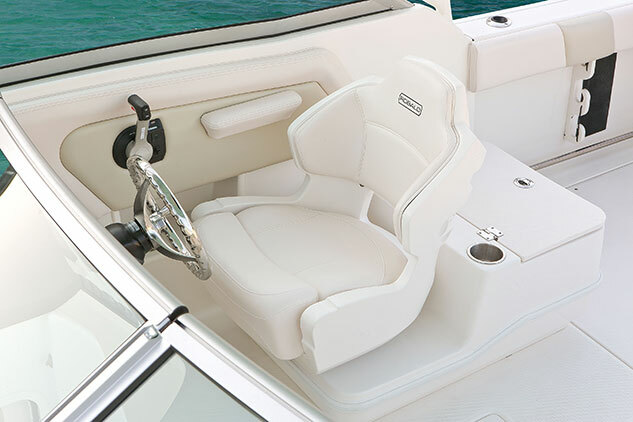 Robalo's supportive bucket seats hold you firmly in place and feature lumbar support with a flip-up front cushion. Upgrade the enclosed head with an optional Comfort Package that includes teak and holly flooring, a solid surface countertop, solid wood cabinetry and a sink. Upgrade the standard port side lounge with a clever triple-position double wide seat that opens up all kinds of seating possibilities. 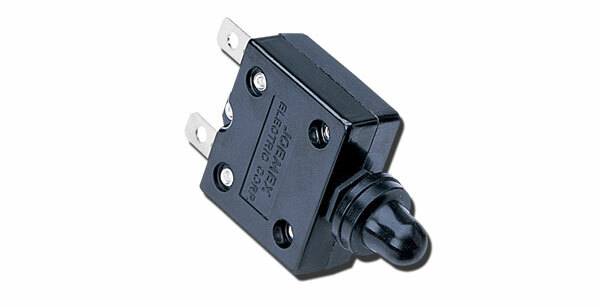 Notice the heavy-duty stainless steel guard rails and premium stitch quality. 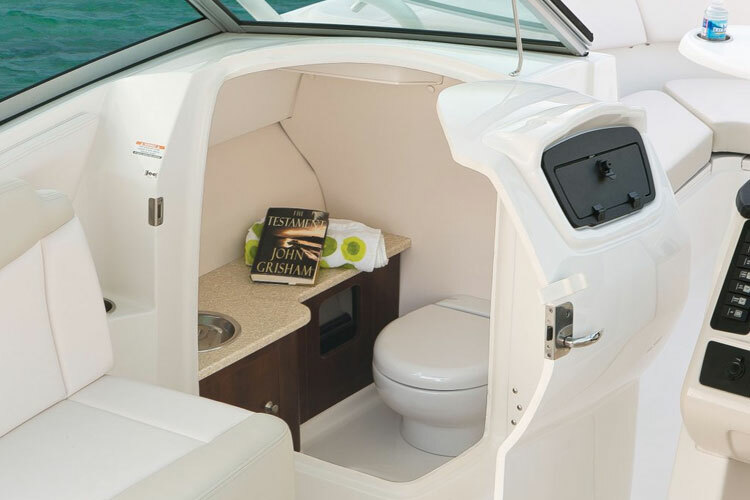 A pedestal seat with a fish box is also available as optional equipment. 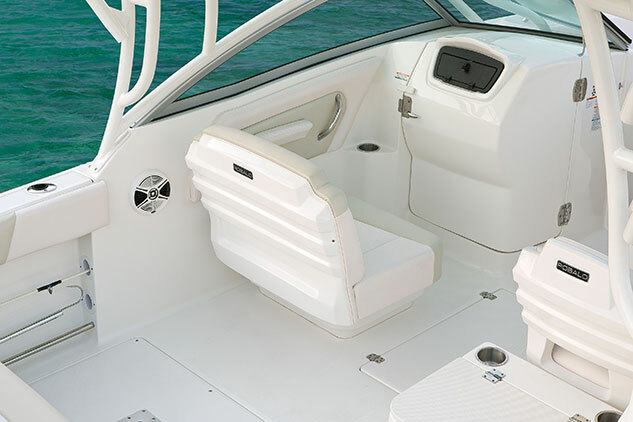 A Robalo exclusive, our optional dual wide swivel port seat can be positioned facing forward, spun sideways or facing aft. Combined with the optional aft seat and standard cockpit table the swivel seat creates the perfect setting at meal time. The transom bench increases seating capacity yet hinges out of the way for open access while fighting fish or enjoying watersports. Standard are the stainless steel toe rails, tackle storage, raw water washdown, a sea strainer along with a knife and plier holder. The standard cooler doubles as a 19 gallon livewell with LED Lighting.